Can certain foods decrease a woman's risk for breast cancer? 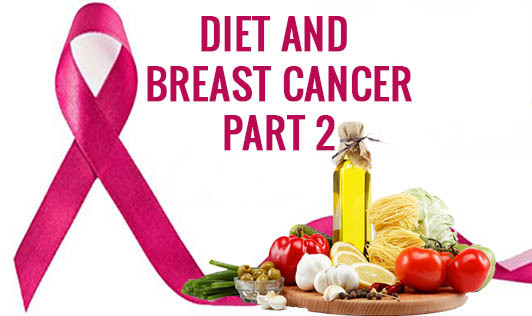 Good nutrition and diet keeps you healthy and can reduce your risk of breast cancer, the most common cancer diagnosed among Indian women today. According to researchers 5 out of 100 cancers could be avoided if people maintain their healthy body weight and 9 out of 100 cancers could be avoided if they follow a healthy diet. Researchers have done a lot of research on the effects of various dietary foods on the risk of breast cancer, most of which have been inconclusive and inconsistent; however there is some evidence found on the following foods. Many studies have been done on the effects of dairy products on breast cancer risk. Few recent studies have shown that high intake of dairy products lowers risk of breast cancer in women. This is because calcium in the dairy products increases their blood-calcium levels and reduces risk of breast cancer. However more research needs to be done on this. Fiber is found mostly in fruits, vegetables, and whole-meal cereals. There are some studies that prove that diets' containing more than 25g of fiber/day reduces the risk of breast cancer in pre-menopausal women. Few recent studies have shown that wheat bran fiber lowers the levels of oestrogen in the blood in pre-menopausal women and reduces the risk of breast cancer. However Researchers aren't quite clear if it's the wheat fiber itself that reduces oestrogen levels in pre-menopausal women or if it's an effect of the antioxidants present in them, which give positive results. Eating more fruits lowers your risk of breast cancer. This is because fruits are rich in fiber and antioxidants. Antioxidants prevents oxidation and gene damage in cells and thus prevents cancer. Scientists have been looking into whether eating soya, could reduce the risk of breast cancer in women. According to researchers diets rich in soya reduces the risk of breast cancer in women. Soya contains phytoestrogens called isoflavones. Isoflavones mimic human oestrogen and reduces the level of oestrogen in the body. High levels of human oestrogen increases the risk of breast cancer. Researchers also found that a soya-rich diet affects the make-up of breast tissue. They found that women who had soya-rich diets were less likely to have the "dense" tissue associated with breast cancer. Carotenoids are organic compounds found in some plants. Some good sources of carotenoids include carrots, spinach, greens, papaya, kale, sweet potatoes, bell peppers, and tomatoes. Meta analyses of various studies have shown that women with higher levels of carotenoids in their blood samples may have a lower risk of breast cancer. Coffee has always been a controversial food and therefore it has been included in this list. A lot of research has been done on coffee drinking and cancer risk. However there is no research evidence to show that coffee increases breast cancer risk in women. If you modify your diet to include more fruit and vegetables, eat less fat, and maintain your weight, you will most certainly reduce your risk of breast cancer.